This 2018 Thanksgiving, we celebrate Native American Indians with exhibits displayed throughout New Jersey. Did you know that early Native American Indians who lived in NJ used only stone tools and weapons or that the Lenape Indians used to live along the shores of Lake Hopatcong? For thousands of years, Lenape civilization is commemorated on our modern map with familiar names like Kittatinny, Allamuchy, Musconetcong, Netcong, Pahaquarry, Hopatcong, and many others. Native American culture has been an integral part of both New Jersey and American history. Go explore a restored village or step inside a wigwam! Please check dates and times as they are subject to change. American Indian Room at the Franklin Mineral Museum contains a collection of stone tools made by Lenape Indians. Also see artifacts from all over U.S. and Mexico, baskets, pottery, drills, axes, spears and more! At Huber Woods, try your hand in Lenape activities - basket weaving, archeology, maize game and more! Play Native American instruments. View and listen to recordings of American Indian musicians and dancers. Ongoing exhibit through July 2019 at the Montclair Art Museum called “Undaunted Spirit: Art of Native North America” highlights Navajo weaving called “eyedazzler”, Navajo silver working, Great Plains tribes baby carriers and beaded dresses, Northwest Indian blankets, headdresses, and masks. Also view contemporary Native American Artwork. 17th century exhibits & programs exploring the history of Indians & Europeans in colonial New Jersey at the NJ State Museum. Featuring Native American artifacts: a dugout canoe, tools, weapons, clothing, ornaments and jewelry. Visit “A Much Moved People: Preserving Traditions of the Delaware Indians” exhibition and see mats, brooms, mortars, shovels, children’s moccasins, and children’s baskets. Featuring Hall of the Eastern Woodlands, Hall of Plains Indians, and Hall of Northwest Coast Indians (undergoing restoration). Showcasing artifacts such as cooking utensils, clothing, weapons, masks, and jewelry. Check out a wigwam, teepee, great house, earth lodge, canoes, and totem poles. Free Admission. The Lenape once lived along the shores of Lake Hopatcong. Learn about the history of the lake and the working of the Morris Canal. American Indian gallery with Native Indian exhibits on pottery, basketry, bead & quill, and textiles. Volunteer run museum and resource center for kids and adults of all ages to learn about the First Peoples of the Lenape and Northeastern Woodlands tribes. Go on a guided tour and get exposed to Indian culture. Touch friendly and interactive exhibits for children. A South Jersey private collection of Native American stone artifacts, pottery, and crafts. Free admission. Explore exhibits on the Native people of the Americas. The imagiNATIONS Activity Center is a family friendly interactive space where your child can explore Native scientific discoveries and inventions - solve puzzles, try experiments, and play computer simulations. 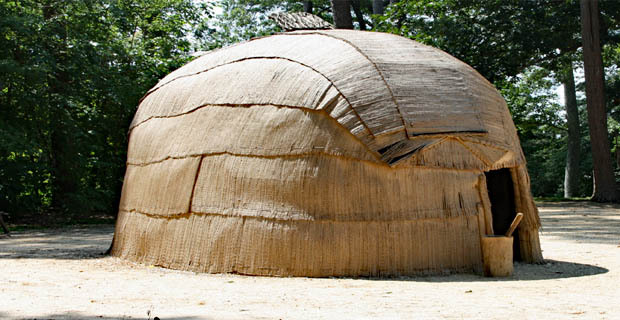 Located within the Watchung Reservation, discover how Lenape Indians lived and step inside a life-size walk-in wigwam. Fun experience for kids! Restored village - see history from a 400-year old Lenape (Delaware) Indian village to a bustling port along the once prosperous Morris Canal. Located in the Bridgeton Free Public Library. Houses a collection of Lenape relics and artifacts - iron stones, weapons, arrowheads, pots, and other daily life tools.